Aisha and Shaheed, the owners of Play and Learn Daycare in Virginia, are lifetime learners — always looking for ways to improve their program, like incorporating family style dining. 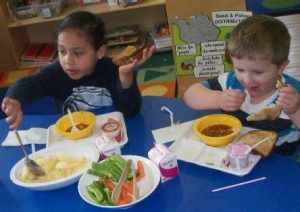 They became familiar with family style dining as a philosophy and wanted to give children the opportunity to gain independence by serving themselves. Early care and education programs who receive food program (CACFP) assistance should now be in compliance with new meal pattern guidelines (effective October 1, 2017). Make sure your menus and procurement reflect these changes.